Schedule Group Trips on Bicycles & Horses. The modern town of Jericho includes the ancient mound known as Tell es-Sultan, the accumulated remains of cities that have existed on the site for some 9,000 years – the Neolithic period. Archaeology reveals that Jericho is one of the oldest human settlements in the Middle East. To get to Jericho from Jerusalem you can take bus 36 or 63 from the Arab bus station nearby Damascus gate (just ask a local if you can’t find it) ; it costs 7 NIS. Ask for Jericho and the driver will drop you off at Al Ezariya where you can get a shared taxi to the center of Jericho for 10 NIS. However, it’s extremely advisable that you have an Arabic translator with you or specifically inquire of the bus driver as to where the Sharut/Shared taxi may be found. For the tourist with no real knowledge of the native language, they may be hard-pressed to get from Ezariya to Jericho. It may be easier to take the route from Ramallah to Jericho and bypass Ezariya/Bethany altogether. The easiest way to get to Jericho from Jerusalem is by using the Arab Bus Station in Jerusalem, and take a bus to either Bethlehem or Ramallah and then procede to Jericho by using sheruts from the bus stations Bethlehem and Ramallah. The “shrut” van from the bottom floor of the Bethlehem bus station takes around an hour to get to the central square of Jericho (20 NIS). Taxi service in Jericho is easy to find. Make sure to agree on a price with the taxi driver before entering the taxi. Prices for taxi rides inside Jericho shouldn’t be more than 15-20 shekels. For taxi rides to sites on the outskirts of Jericho, it’s best to negotiate a fair price. You could also take an egged bus from Jerusalem central bus station directly to Jericho for 12 nis. Busses throughout day from 7AM to 22PM. 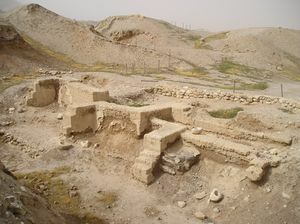 Tell es-Sultan (ancient Jericho) – This site is the center of archaeological digs in Jericho. It is the location of the ancient Jericho of the Biblical times and is located some 2 km north-west of the modern city centre, overlooking the natural spring of Ein Sultan. It costs 10 NIS to enter. Shalom al Yisrael Synagogue Mosaic Floor– In between Tel es-Sultan and Hisham’s Palace, there is a synogogue floor from the 6th century C.E. Look for the bent, orange sign that says Synagogue or בית כנסת, look straight across the street and there is a road going diagonal towards some Palestinian flags. The synagogue floor is in the basement of a private house belonging to a Jerusalemite family the Shahwans at the end of the street. It costs 10 NIS to enter. The family discovered the site and kept maintaining it until the Israelis confiscated the land and the house in 1987. 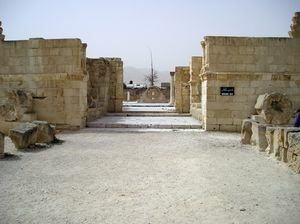 Hisham’s Palace – 2 km north of modern Jericho, this winter palace was built by the Omayyad Caliph Hisham Ibn Abdul Malek, before being destroyed by eathquake soon after completion in 747 CE. The extensive site contains royal buildings, a mosque, water fountains and spectacular mosaic floors. It costs 10 NIS to enter. Tomb of Moses/ Maqam an Nabi Musa This Muslim monument to Moses is originally thought to have been built as a site to view the traditional burial spot of Moses on Mount Nebo from Jericho. However, local Palestinian Muslim folklore later on attributed the site in Jericho as the actual resting place of Moses whose remains were brought across the Jordan River from Mount Nebo by Salahaddin during the Crusades. The complex is open to the public and contains a coffin decorated in colourful carpets that is said to hold the remains of Moses. Local Bedouins call the rocks surrounding the complex Moses rocks (Arabic: احجار موسى‎, ihjar Mousa) and make them into protective amulets to sell to visitors. Mountain of Temptation. Hike up to or take the cable car up to the mountain believed to be the site where Jesus was tempted by the devil. On the top of the mountain is an ancient Greek Orthodox Monestery. Jesus’ Baptismal site/ Qasr al Yahoud. Located nearby Jericho on the Jordan River is the site where Jesus was baptised by John in the Jordan River(this site in Jericho is recognized as the authentic site as opposed to the fake, touristy one set up in Northern Israel at Yardenit). It is also believed to be the spot described in the Old Testament where the Israelites crossed the river to enter the Land of Canaan. Qumaran Caves. This complex of caves is the site where the “Dead Sea Scrolls” were discovered. It is now an archaeological park and visitors tourist center that is managed by the Israeli Nature and Parks Authority. Wadi Qelt Synagogue. This synagogue is thought to be the oldest synagogue in the world. It is part of the “Jericho Royal Winter Palace” complex that was constructed in the Second Temple Period. Naaran Synagogue. This ancient synagogue also contains a floor decorated with mosaics. It’s definantly beautiful to see!! 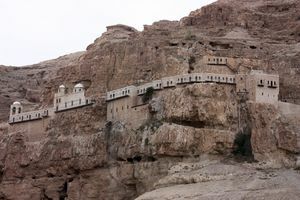 The Monastery of Gerasimus of the Jordan (Deir Hajla), (outside Jericho). The Greek Orthodox monastery of Deir Hajla near Jericho commemorates St. Gerasimus, whose lavra was nearby. Gerasimus left his family wealth and worldly affairs to become a monk. He departed for the region Thebaid in the Egyptian desert, later again returning to his native Lycia. About the middle of 5th century Saint Gerasimus went to Palestine and settled in wilderness near the Jordan River. There he established a monastery and became known for his righteous life of asceticism and prayer. The story of Gerasimus and the lion, when the saint tamed the animal by removing a thorn from its paw and taught it obedience, became widely known in the Christian world. He is reputed to have attended to the Fourth Ecumenical Council at Chalcedon in 451.The history of the monastery is also linked to another Christian narrative. Mary, Joseph and the infant Jesus were said to have found refuge in a cave here during their flight from Herod. An underground chapel was built on the spot where the Holy Family is believed to have spent the night. The crypt floor also contains the bones of monks who were massacred during the Persian conquest of the Holy Land. Sycamore Tree of Jericho, (city-centre). This tree is referenced in the Bible due to it’s association with Jesus’ visit to Jericho: “Jesus entered Jericho and was passing through it. Now a man named Zacchaeus was there; he was a chief tax collector and was rich. He was trying to get a look at Jesus, but being a short man he could not see over the crowd. So he ran on ahead and climbed up into a sycamore tree to see him, because Jesus was going to pass that way” (Luke 19:1-4, NET Bible). ‘Quruntal mountain’ – this is a Greek Orthodox monastery situated high in the rocks, and is the biblical setting for Jesus’ temptation by the devil. It houses two Greek Orthodox priests – one aged c.30 arrived from Greece in November 2010 and will stay there for the rest of his life. The other has been there for decades. From this precarious rocky spot you get a great view of Jericho and the Jordan Valley over towards Amman. Participate with visiting archaeologists in the many archarological digs taking place in the Jericho area. Hike the trails surrounding Jericho. Jericho is known to the local population as an area surrounded by beautiful surroundings. There are numerous hiking trails that have beautiful views of the oasises surrounding Jericho. Make sure to bring lots of water, Jericho is also known to the locals for its hot weather!! Go for a camel ride in the desert, (Bedouins walking around with decorated camels). So much fun! Make sure to agree on a price before hand. Kaliya Beach. This beach on the Dead Sea is managed by the nearby Israeli settlement of Kaliya. They usually allow Palestinians to use the beach as well. There are Bedouins selling a variety of goods in Jericho, but the prices for them aren’t much cheaper than other places. Food, however, is significantly cheaper in Jericho. Near the Central Square, there are many places for quick bites, especially in the direction of the Sycamore Tree or Hisham’s Palace. It worth a visit to Qurantal mountain where Jesus fasted 40 days and 40 nights after the devil’s temptation to him, where you will find a very nice restaurant at the bottom of the mountain, you will have your lunch in front of an amazing panaromic birds eye view of Jericho city ,the mountains of Jordan and the Dead Sea. You can reach this restuarant by using the Cable Car of Jericho, it costs ( ~$15 )55 NIS / Person for a 7 mintues trip of about 1.35 Km. Jericho is famous for its tasty fruits, especially bananas!! The town is pretty much alcohol free except in the hotels and resorts. Sami Youth Hostel, ☎ +972 02 232 4220. The hostel includes all hotel services and facilities, consists of 22 rooms and 5 suites. Rooms have been designed to fit the visitors’ needs. Available are single, double and triple rooms; all equiped with air conditioning, television, device connectors, satellite, refrigerators and internet service. The nearby Allenby Bridge Crossing leads to neighboring Jordan. It is an Israeli-managed crossing mainly used by Palestinians to travel internationally because Palestinians are required by Israel to use the the airport in Amman, Jordan rather than the airport in Tel Aviv. Because this border crossing is located in the Palestinian Territories, it has a different status than the rest of the Israeli-managed crossings. This crossing and this crossing only requires tourists who use it to enter Jordan to have an entry visa before using the crossing. Make sure to have a valid, non-expired entry visa (prefereably multi-entry) for Jordan before using this crossing to get into Jordan or else you will not be able to use this crossing. Entry visas for Jordan can be received in advance at the Jordanian embassy in Ramallah, Palestine or Ramat Gan, Israel.